I've went from hardly getting any time on a bike to getting loads. 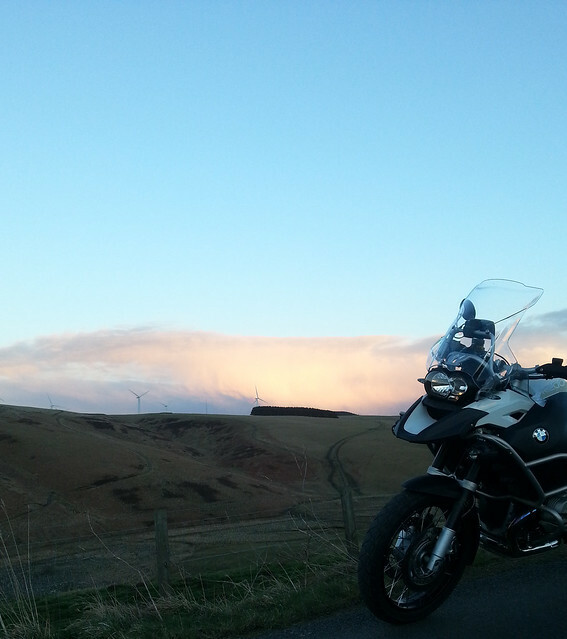 I've had a few spins here and there on the GS but I've been riding other bikes too. First up, the Harley. Faithir acquired Bert's Harley. It had developed a noisy big end so he stripped it down and rebuilt it, complete with a custom paint job from Smillie Paint. 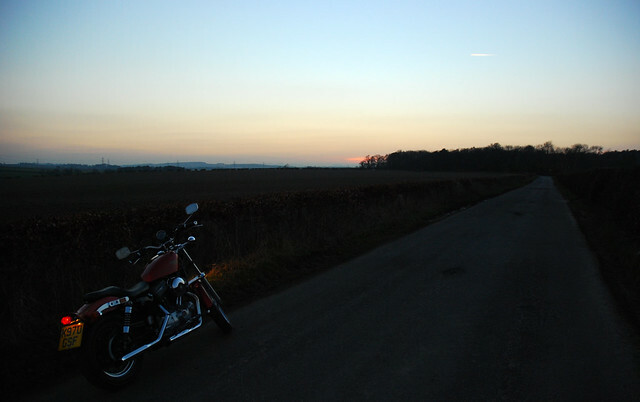 The bike is a '92 Harley Sportster. No rubber mounted engine or any of that pish. Riding it is an experience from times gone by. The technology on the bike is pretty old, the brakes are shite and if you hit a bump you're eyes feel like they're gonnae fall out your head. Magic carpet it ain't. But I love riding it. The sound is awesome and once you dial your brain into the bike it's great fun. You still need to get your lines right though the corners and plan your gears selection and braking out properly but it all happens as a slower speed and a more sedate pace. 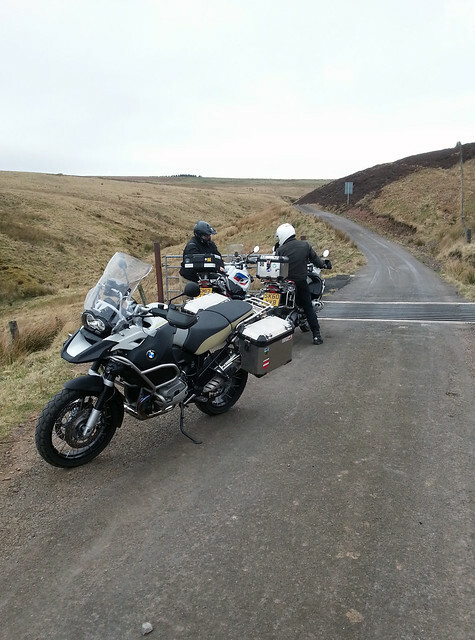 The wee Harley is great fun up the quiet back roads in the Lammermuir hills. As I said, I love it, but it's not for everyone. Next up. 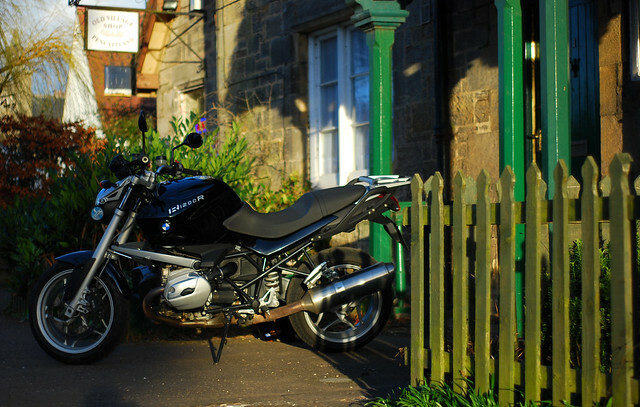 A BMW R1200r. 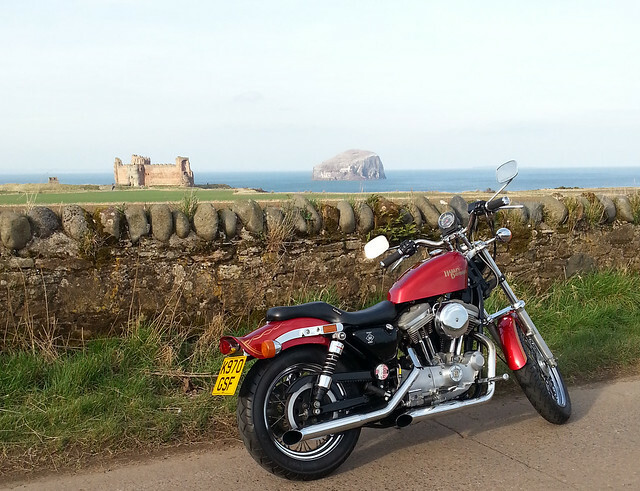 I had this bike, known as Barry the Boxer, as a courtesy bike from Motorrad Central while my GS was in getting a service. This is the only downside about having a brand new bike, you have to pay for a service. 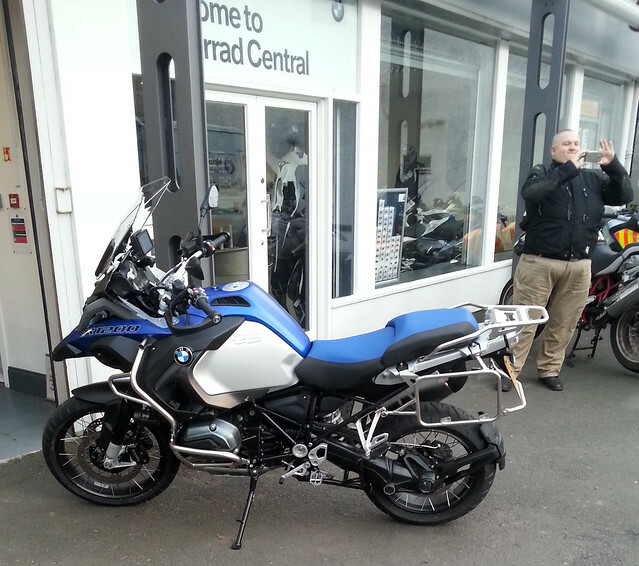 With my 1150 I done all the servicing myself at home but the new bike needt a dealer service to keep up the warranty. 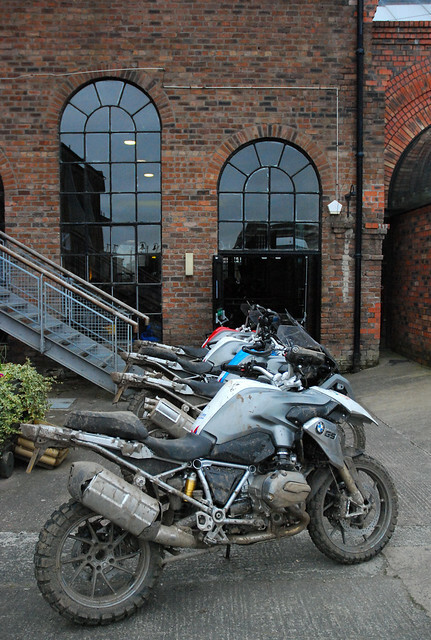 It's great not having to service the bike myself and having the back up of the BMW warranty that covers me all over Europe, but its not cheap. My 6K service was £315 which gave me fresh brake fluid, gearbox and engine oil and a new oil filter. My valve clearances were checked and throttle bodies were synchronised too. The R1200r feels much smaller than the GS but doesn't feel as chuckable or as planted in the bends. It was fun riding a naked bike again though. It feels quick when the wind is hitting you in the chest when you're accelerating hard. I went for a wee spin and snuck into the Museum of Flight for a photo with the Vulcan Bomber and then had a spin home via Gifford with Bob on his GS. 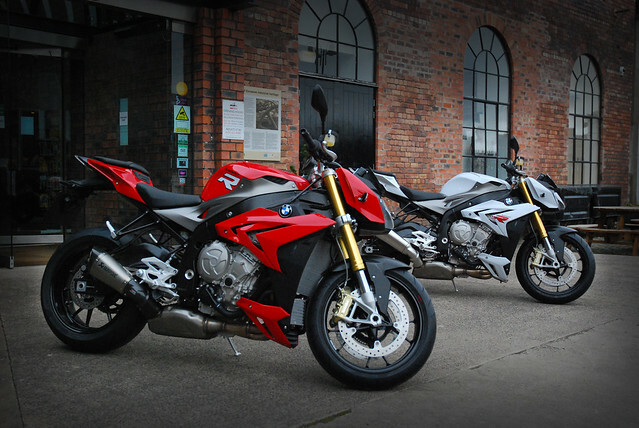 A few of the Massif also attended the launch of BMW's new bikes. 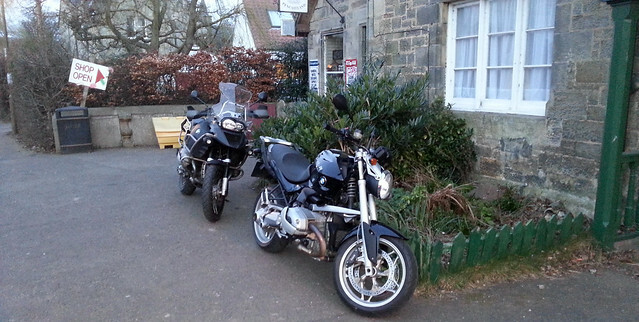 We scoffed the free food and looked at the bikes before Smillie, Faithir and myself went for a spin over the Lammermuirs for a coffee at Smillie's cave. Faithir took better photos than I got at the launch so I'll get him to do a write up of it. Motorrad will be doing off road events at Knockhill with these in the future. More soon. I'm planning on getting as much biking in as possible.